New Ball Milled 1-piece design. 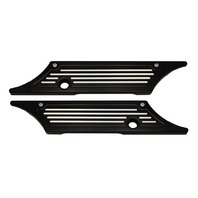 CNC machined from solid Billet Aluminum for 1993 thru 2013 Harley-Davidson Touring Models. Durable black anodized. Sold in pairs. Simple bolt-on installation. Includes all necessary mounting hardware.